In my recent post, I shared my Google Adsense placement experiments. I have updated my theme several times to make it more user friendly and focusing on content and to experiment Adsense placement. 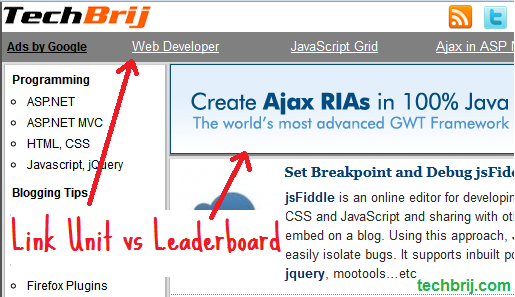 Ads shouldn’t irritate the user, so I decided to keep one of Ad Units (Either Leaderboard or Link Unit) in header. I used Link unit as navigation menu with theme colour combination and supposed to have Good CTR and LeaderBoard unit just below the menu as in following image. 1. If Both are used then LeaderBoard has slightly better CTR than link unit but overall earning is mixed. 2. If only Link Unit is used, it doesn’t have good CTR as supposed to happen and Low CPC means overall earning is down. 3. If only LeaderBoard is used, It has good CTR and sometimes giving more earning than 336×280 ads-unit. I see overall earning from this unit is progressively increasing. So, I removed Link Unit as navigation menu because so much ads irritate the user and now I focus on quality and content. One more cons of using Link Unit as navigation menu is less PageViews/Visits factor. It’s my personal experience. Your experience might be different. Never assume, Test and see what works for you. I’m interested in other’s experiences with the ‘Link unit’ and ‘Leaderboard’ ads. Share your opinion in comment box.